This month I finished one biiiiiig project - my mom's Curlicue Crush quilt ("Mint Chocolate Chip"). This was a huge victory for my piecing skills - curves for the first time! I think SWC primarily motivated me to finally get this one done, a year and a half after it was started. Oh, and she loved it :) It easily took up the majority of my free time this month. I also finished my reversible Halloween/Thanksgiving tablerunner - yay! We used it at my mom's for Thanksgiving, after it rested on my table all month. My table is currently looking pretty sad though... clearly, another reversible tablerunner is in order. I made my first voile scarf for my sister's birthday. She wears it around all the time and it makes me so happy! 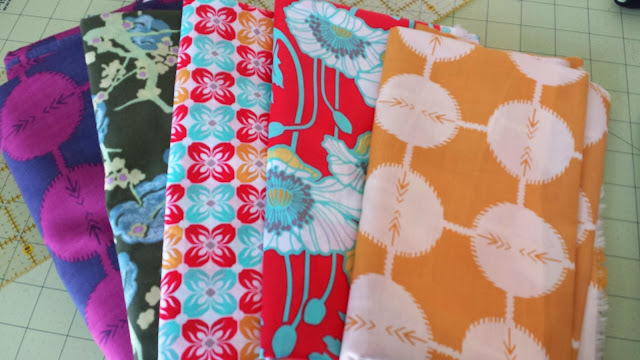 Speaking of which, I may have just ordered/received more voile from Hawthorne Threads... I see Christmas gifts starting this week. 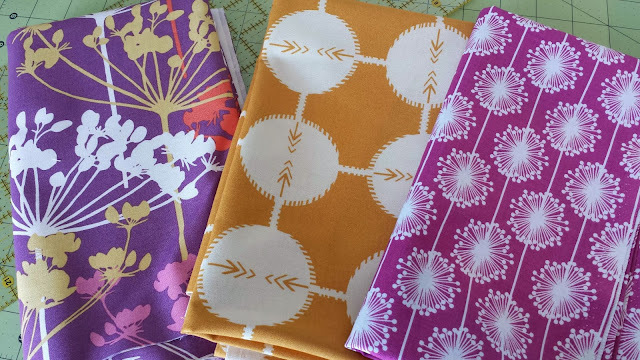 Also, that bottom purple AMH voile is for my very own Washi shirt (or dress - we'll see - I bought enough) - but that's for the new year ;). I kind of wish I could horde this voile, but I really should put it to good use... right? I also finished another commission t-shirt quilt - for my cousin. It came out great - I quilted in swirls and horizontal lines. I can't really show what else I'm working on right now - unfortunately. It's the holiday month so many things will be under wraps. Gosh you were busy in November! I'm pretty sure I've already told you how much I love that fall tablerunner. Just gorgeous! You are as busy as a beaver. You must be very well organised! Oh wow - the curlicue quilt is amazing!! I may have to make this quilt - the pattern is stunning. Well done on some great finishes. All gorgeous! The mint choc chip quilt is amazing! productive! love how Mint Chocolate Chip turned out : ) and love your new fabrics! That's a good goal. Looks like you make a lot of gifts, too! Hi Jess, love that mini cholclate chip quilt! Congrats on your big finish and accomplishing your first curves quilt! It's a beauty. 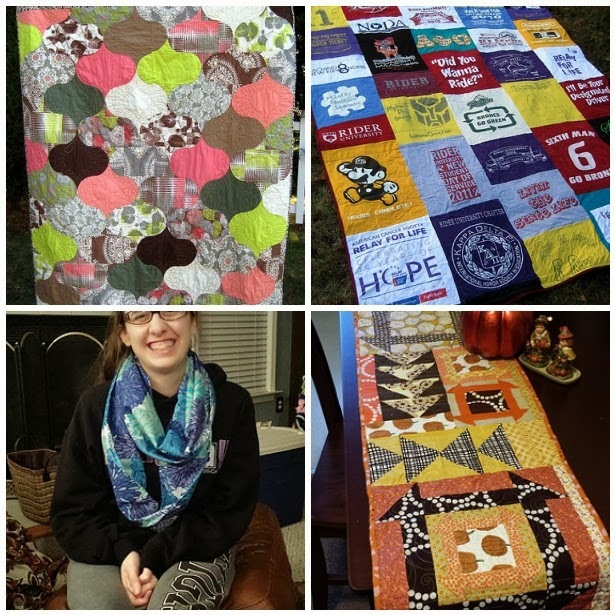 Your T-shirt quilt is wonderful too, Jessica! AND Mmmm... Fabic goodness! Thanks for sharing!